A CONSIDERABLE avalanche danger exists on all aspects at elevations above 1,000'. Human triggered avalanches are likely and natural avalanches are possible. A variety of avalanche problems will be seen today: storm slabs 8-14" thick, wind slabs 1-2' thick, loose snow avalanches and glide avalanches. If you are headed into the Turnagain Pass or surrounding areas very careful snowpack assessment and cautious route-finding will be necessary. If the sun comes out, it will act as a trigger for the types of avalanches listed above. This is a day to have patience and let slopes steeper than 30 degrees have time to adjust. Safer places to recreate will be on mellow terrain, with nothing steep above you, or in the flats. **Areas on the periphery, such as Portage Valley, that received more snow, a HIGH avalanche danger could be seen. If you are headed to the Summit Lake area don't forget to check Summit Lake Summary. Is it already the first day of spring? After rounding out the final week of winter with a stable snowpack, we head into spring with quite the opposite. As of this morning, a two and a half day storm is just finishing up. We have seen anywhere between 12 and 24" of snow at the high elevations and this snow is unstable (more on that below). Several human triggered slabs and sluffs were triggered yesterday - see those reports HERE and HERE. One notable comment is the debris has been running much further than expected; likely due to a crust under the new snow. We have a classic 'storm slab' avalanche problem in the backcountry. This basically means denser snow fell on top of lighter snow which creates a slab/weak layer combo. This set-up was quite sensitive to human triggers yesterday and is expected to be the same today. This combo also sits on a curst in many places which can allow debris to run longer than expected. Slab thicknesses depend on how much snow fell, roughly 8-14". Although the Easterly ridgetop winds have died down, don't forget they did blow very strong over the past 24-hours. Wind slabs are likely sitting on weak low density snow and could take a few days to adjust, which makes them likely to trigger today. Wind slabs are a similar beast to the storm slab, but they are thicker due to the wind-loading aspect, 1-2+ feet thick. Areas above 2,500' with drier snow and where a slab has not formed, dry sluffs will be a concern. On Southerly aspects these could become damp and easy to trigger with possible sunshine. Add to that, a sun crust sits under the new snow, which with allow these sluffs to run much further than you may think. At elevations below 2,500' watch for wet loose avalanche activity. The new snow at these lower and mid-elevations is damp to wet and easily pushed into a sluff. The crust sitting under the 6-10" of wet snow is letting these sluffs run quite far and on mellow slopes as mentioned above. If the sun comes out today, it will act as a trigger we could see many wet loose snow avalanches occur. With two days now of very limited visibility, it is hard to know if there has been recent glide activity or not. Nonetheless, continuing to avoid being under glide cracks, in the case they release and avalanche, is key! It's just not worth it on slopes where the snowpack is falling apart and oozing down the mountain. Take a minute to work with your partners to map out glide cracks in the area you are recreating. Yesterday's up-side down storm system is winding down and coming to a close. During the past 24-hours we have seen around a inch of rain below 1,200' with 6-8" of wet snow above this. Some areas saw rain up to 1,700'. 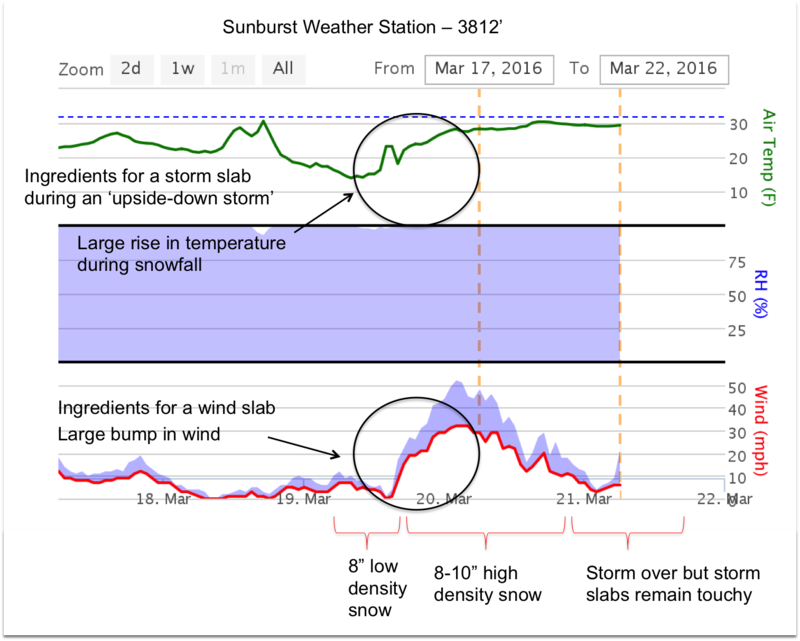 Ridgetop winds associated with the snowfall were strong, hourly averages as high as 40mph from the NE at the Sunburst weather station. Temperatures were warm, mid 30's below 2,000' and up to 30F at 2,500'. For today, we should see a break in precipitation with partly cloudy skies. There is a chance the sun could poke out here and there. Ridgetop winds are forecast to remain light to moderate, blowing in the 10-20mph range from the East. Temperatures continue to be warm with parking lots seeing upwards of 40F and up to the mid 30's at 3,000'. Tomorrow, Tuesday, another weak disturbance will move through with increased winds. This is ahead of a stronger system (but hopefully a cooler one) slated for Wednesday. It seems spring is technically here but the long sunny days have yet to arrive.